From Madrid To Hollywood is an innovative project involving musical coaching and pedagogic practices. To achieve personal growth we emphasize in modern studies through constructive perspectives. 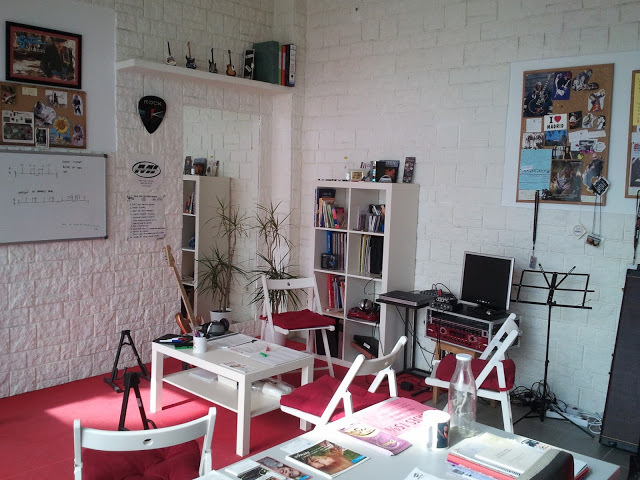 At From Madrid To Hollywood we believe that Music and Art are some of the most important assets of society. Music and Art are considered changing generators which directly influence the emotions and attitudes that people develop through life. Music always keeps us company everywhere we go. It can make us laugh or cry, it gives us energy to confront situations and helps us communicate with a language far beyond logic and rationale, it connects us with the deepest part of our innerself. Human kind needs to feel and communicate today more than ever to complement and balance out with technology's strong role in the present. Some studies within different cultures are starting to demonstrate that there is a stretched relation between determining intervals and emotions which act in a physical manner due to the cultural information we receive thus effectively demonstrating that music is the universal language. For all this at From Madrid To Hollywood we want to reestablish the role of Music and musicians role as well as Art and it´s artists through quality education in liberty for all regardless of opting for a professional career or interest and pleasure. Anthropologic studies of Thomas Fritz support the idea of music as the common universal language. - The German Max Planck Institute for Human Cognitive and Brain Sciences. MOTIVATION and FUN are our leitmotiv. Therefore, we always like to know the preferences and goals of our students, and teach focusing in their musical repertoire. We work by goals, using curriculum contents, action plans and follow up coaching to know where we are and where we want to go. Some subjects that we consider essential are KNOWLEDGE OF INSTRUMENT, IMPROVISATION AND REPERTOIRE. We use new technologies and there are some programs that we use and highly recommend: Guitar Pro, Band In A Box, iRealb or Synthesia, both for guitar, keyboard and for any instrument. 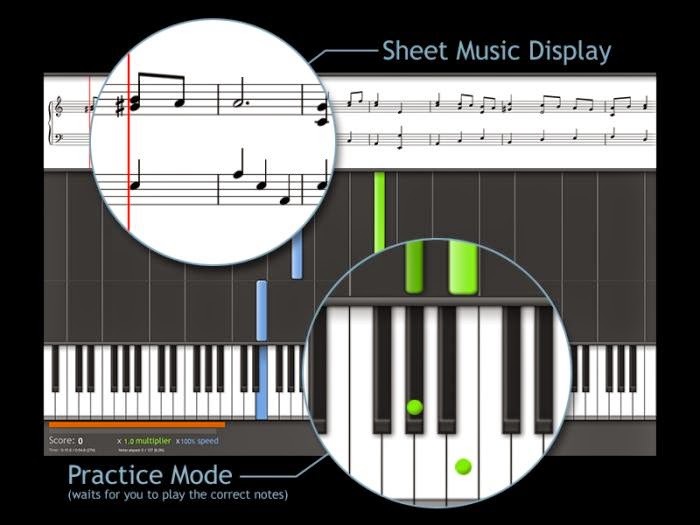 Why teach and learn with Guitar Pro or Synthesia? - They have numerous tools to learn difficult passages. In Guitar Pro for example, we can select a passage and put it in different speeds, or use Loop or a Speed Trainer, and we have the display of guitar fretboard or keyboard options. 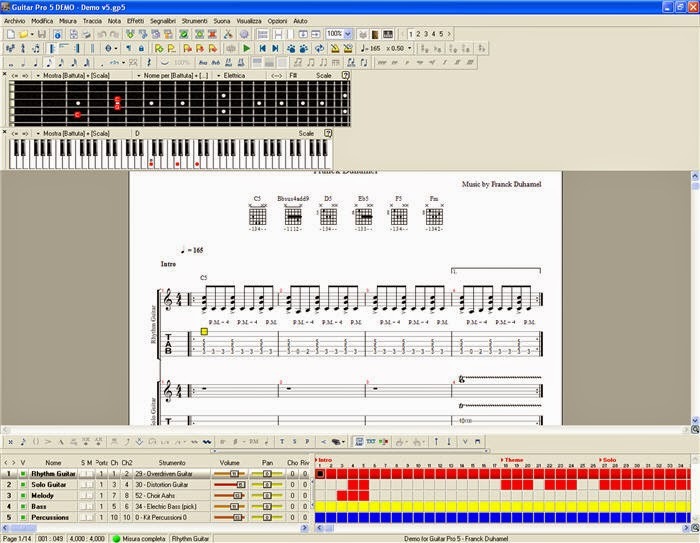 - You can display a passage while playing in both tablature and standard musical language. - There is a vast catalog of songs to which you can access in record time, as the occupying few Kbs, MIDI files are very easy to handle. We consider Music as a discipline that has a very important social component and thus foster the relationship between students creating ensembles and social events. We also have a jam session in Madrid, Spain, in which those who wish can play alive. There are various things to consider and question at the time that you choose a professor. It is crucial to know the technical experience as well as the pedagogic of the candidate. Being a good musician does not imply or justify being a good professor. Teaching requires concrete technical l knowledge adequate to the age of the student. It is not the same to teach an 8 year old as opposed to teaching one of 40. Knowing some physiological factors that stimulate the student such as motivation, or mental basic processes such as the association of ideas and construction of knowledge based on these processes are key components that will lead to successfully achieve those learning goals. These aptitudes that with frequency are obvious and results are demonstrated through such educational sciences for decades seem to mark the different between musical education in many countries. Pioneer countries in applied psychology and musical education have created musicians with exceptional faculties which are not a result of chance, but of a quality educational system. It is important to be conscious of the level one would like to deepen. If we want to learn basic notions of music in order to play some chords or sing songs, we simply need a person with patience that has gone through those notions and are capable of transmitting this knowledge. If we also want to be capable of performing some riff of concrete style, it is crucial that the professor dominates such style and peculiarity as well as having the minimum knowledge of pedagogic materials to assist in relating the type of riff and or rhythm where we can connect the scales and harmony within our musical global perception. If a further level is desired and would like to study music in a deeper more serious professional level, our professor must dominate not only the subject matter but also specialize in the instrument and cover a great number of styles and musical elements including a specific pedagogic formation. We teach classes all around the globe via Skype, in Spanish and English, and also have highly qualified professionals in different locations. Anyway, we have a physical office in Boadilla del Monte (Madrid, Spain). The mall is next to the Sport Center Manolo Santana and a roundabout that says "Las Lomas" in the urbanization Las Lomas. It is next to Avenida de Las Lomas following Avenida Valdepastores that starts right from Boadilla- Majadahonda Road (M-516) that also has easy access by M-40 and M-50. From Boadilla it can also be accessed from Viñasviejas, through Monte Segovia Street.